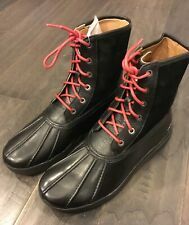 Ralph Lauren Polo Leather Winter Boots Mens Sz 8D. Condition is Pre-owned. Still a lot of life left. Shipped with USPS Priority Mail. Style: Dennison - Color: Tan/Brown - Size: 8D. ~ Polo Ralph Lauren ~. Pull-on loop. Leather Upper. Leather laces. If you are looking for nice designer clothing you have found the right site. 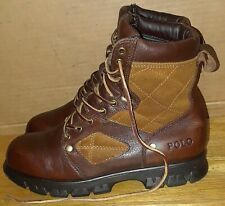 Up for sale is aNEW - Ralph Lauren Polo Wakely Boot. Brand new in the box polo Ralph Lauren Declan. Authentic item. Water resistant but not water proof. Retails for $150. 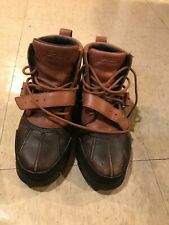 These are a pair of vintage Ralph Lauren Men's size 8D/M brown leather hiking outdoor boots. The interior of the boots are in impeccable condition. These boots are in very good condition for their age. Please contact if you have any questions. I will mark the SHOES as low Value so. NEW IN BOX. DOUBLE Money Back. POLO RALPH LAUREN TEAM USA 2010 OLYMPIC BOOTS mens 8 NEW RARE MUST HAVE !!!! 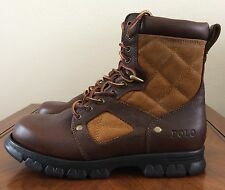 POLO RALPH LAUREN AN OFFICIAL OUTFITTER OF THE 2010 USA OLYMPIC TEAM BOOTS. VERY RARE! RUBBER OUTSOLE. EMBROIDERED LOGO ON THE SIDE. Ralph Lauren Polo Men's Black Leather Ranger. Condition is Pre-owned. Shipped with USPS Priority Mail. AS FOUND AS IS. BOOTS AS FOUND,,,,,,,,,,GOOD BOOTS. WEAR AS IS,. as shown. RECIEVED IN CONDITION SHOWN. WEAR AS IS.LOTS OF LIFE LEFT. We will find a way solve the problem. RESERVE SET. 100% Authentic. Rubber toe guard. Contrasting double-needle-stitched detail at the upper. Size : 9D (UK 8, EUR. 42, CM27.5, CN43.5). Designer: Ralph Lauren. Material : Leather Upper, Leather Lining and Rubber Sole. SOLID BOOTS. We will find a way solve the problem. FREE Trial !